- Vol. 1, no. 1 (Oct. 24, 1942)-vol. IV, no. 31 (July 28, 1945). - Published for the Heart Mountain Relocation Center established by the War Relocation Authority for Civilians of Japanese ancestry. Hāto Maunten senchineru: Japanese edition of Heart Mountain sentinel . (Heart Mountain, WY), Jul. 19 1945. https://0-www.loc.gov.oasys.lib.oxy.edu/item/sn93070119/1945-07-19/ed-1/. 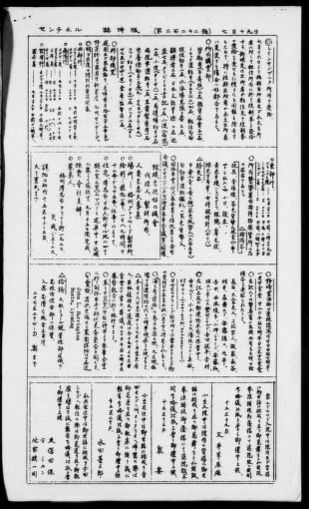 (1945, July 19) Hāto Maunten senchineru: Japanese edition of Heart Mountain sentinel . Retrieved from the Library of Congress, https://0-www.loc.gov.oasys.lib.oxy.edu/item/sn93070119/1945-07-19/ed-1/. Hāto Maunten senchineru: Japanese edition of Heart Mountain sentinel . (Heart Mountain, WY) 19 Jul. 1945. Retrieved from the Library of Congress, www.loc.gov/item/sn93070119/1945-07-19/ed-1/.